FILE PHOTO: Members of the Iranian revolutionary guard march during a parade to commemorate the anniversary of the Iran-Iraq war (1980-88), in Tehran September 22, 2011. ANKARA/LONDON - Iran’s elite Islamic Revolutionary Guard Corps, a military force with political clout and an industrial empire, stands to benefit from heightened tension between Washington and Tehran, officials and analysts said. President Donald Trump broke ranks with other major powers earlier this month by disavowing Iran’s compliance with a 2015 multinational nuclear deal, complicating life for foreign investors nervous of possible new U.S. sanctions. The IRGC, which reports directly to Iran’s Supreme leader Ayatollah Ali Khamenei, began rapidly expanding its commercial interests a decade ago, before U.S. and EU sanctions were imposed on Iran’s oil and finance sectors in 2012 over the country’s nuclear program. It controls businesses ranging from ports management to telecommunications and has made the most of both cooling and warming ties with the West. When Western oil companies vacated energy projects in Iran after 2012, the Guards took them on; after the penalties were lifted in 2016, the IRGC, through front companies, served as a conduit for foreign business flowing into Iran. If investors are put off again, the IRGC is ready to step in, said an official from Khamenei’s camp. “We want foreign investors to stay, but if they leave because of (U.S.) pressure, the Guards can easily replace them. There is no better alternative,” the official said, declining to be named because he was not authorized to speak to media. Under sanctions, Iran’s clerical rulers rewarded the Guards by showering them with contracts for skirting the restrictions as well as for suppressing dissent at home and helping Tehran’s regional allies from Iraq to Lebanon. The IRGC’s lack of technical expertise and concern over the viability of its economic ventures under sanctions meant it later welcomed pragmatist President Hassan Rouhani’s deal that eased sanctions in return for curbs on the nuclear program. Khamenei, a hardliner who holds ultimate authority on matters of state in Iran, guardedly endorsed the nuclear accord but has said Rouhani’s economic follow-through has fallen short. To bypass existing unilateral U.S. sanctions, which bar any business with the Guards and its affiliated firms, many of the IRGC’s front companies are not even formally owned by the Guards, but by individuals and firms linked to it. Rouhani has tried to encourage reluctant major European firms and banks to return to Iran by seeking to curb the Guards’ involvement in the economy, which led to the IRGC transferring ownership of some companies to the state. In recent months, the IRGC, which sees itself as a bulwark against Western influence, has responded by criticizing Rouhani for viewing foreign countries as the key to economic growth. “The IRGC will be the main beneficiary of the tension with Washington ... In order to protect its economic dominance, the IRGC prefers only limited opening to the West,” said a Western diplomat who follows Iran closely. While backing the nuclear deal, Europeans share Washington’s concern over Iran’s ballistic missile program and “destabilizing” regional behavior. The IRGC has vowed to accelerate the disputed missile program and Iran’s Shi‘ite militia proxies have made big military gains in recent months in Syria and Iraq, part of a decades-old tussle for influence in the Middle East with Sunni powers. Tehran emphasizes its role in battling Islamic State. Many foreign firms remain hesitant to invest in Iran for reasons including lingering unilateral U.S. sanctions imposed over human rights violations and alleged Iranian links to terrorism, and the dominant role of the IRGC in the Middle East’s second largest economy. Among European firms that have announced big deals in Iran since last year are planemaker Airbus AIR.PA, French energy group Total TOTF.PA, and Germany’s Siemens SIEGn.DE. Planemaker Boeing is the only U.S. company that has been granted direct access to the Iranian market with a deal to sell 110 plans to two Iranian carriers. But Trump’s hawkish new approach towards Tehran, coupled with banking worries and domestic political turbulence in both countries, are causing growing uncertainty over Iran’s plane deals. Iranian officials have acknowledged publicly that major international companies are still wary of providing finance for Iran-related business, fearing potential fines resulting from existing U.S. sanctions, which include a ban on dollar related trade with the country. Iran needs the equivalent of billions of dollars in investment to revitalize industries including oil and gas and develop sectors held back by a lack of Western financing and the wide economic influence of the IRGC. These factors have all added to the difficulties faced by foreign investors looking to tap Iran’s market. “The commercial issue is the turbulence that Trump creates,” Andreas Schweitzer, managing director with London-based M&A and investment advisory firm Arjan Capital Ltd, which has been investing in Iran since 2009. He said transactions were nevertheless still taking place, including in the automotive, energy and industrial sectors, in the one hundred million to two hundred million euros sphere. Merger and acquisition deals were among them, he said. Following Trump’s speech, U.S. Treasury Secretary Steven Mnuchin said he planned to impose new sanctions on the Guards and would work with international counterparts on the issue. Charles Blackmore, chief executive of London-based due diligence specialists Audere International, which is active in Iran, said the policy shift by Washington would have “an adverse effect upon the more risk adverse investor”. ”For those who are already invested and know the country well, this will not make a blind bit of difference,” he said. The survival of the nuclear deal is up to the U.S. Congress, which has 60 days to decide whether to reimpose broad sanctions on Iran. The U.S. administration has said Washington will not stand in the way of European trade and business transactions with Iran. Matthew Oresman, counsel with law firm Pillsbury Winthrop Shaw Pittman, who advises companies on Iran compliance issues, said Washington had considerable power and leverage to disrupt trade with Iran if that served its national security interests. ”But the European governments have ways to dampen this and protect their businesses if they so desire,” he said. 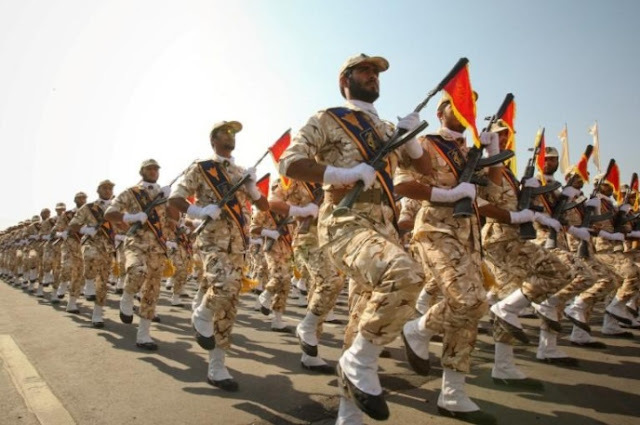 Iran’s elite Islamic Revolutionary Guard Corps, a military force with political clout and an industrial empire, stands to benefit from heightened tension between Washington and Tehran, officials and analysts said. President Donald Trump broke ranks with other major powers earlier this month by disavowing Iran’s compliance with a 2015 multinational nuclear deal, complicating life for foreign investors nervous of possible new U.S. sanctions.